February 22, 2016 – When the first astronauts travel to deep space in Orion, they’ll know their mission is solidly built on years of hard work by engineers on the ground. While manufacturing and assembly work continues on the Orion spacecraft for its first uncrewed mission atop the Space Launch System (SLS) rocket in 2018, currently known as Exploration Mission-1, a multi-NASA center team also has been busy developing displays and controls for flights with astronauts and testing advanced software to ensure human deep space missions on the journey to Mars are a success. 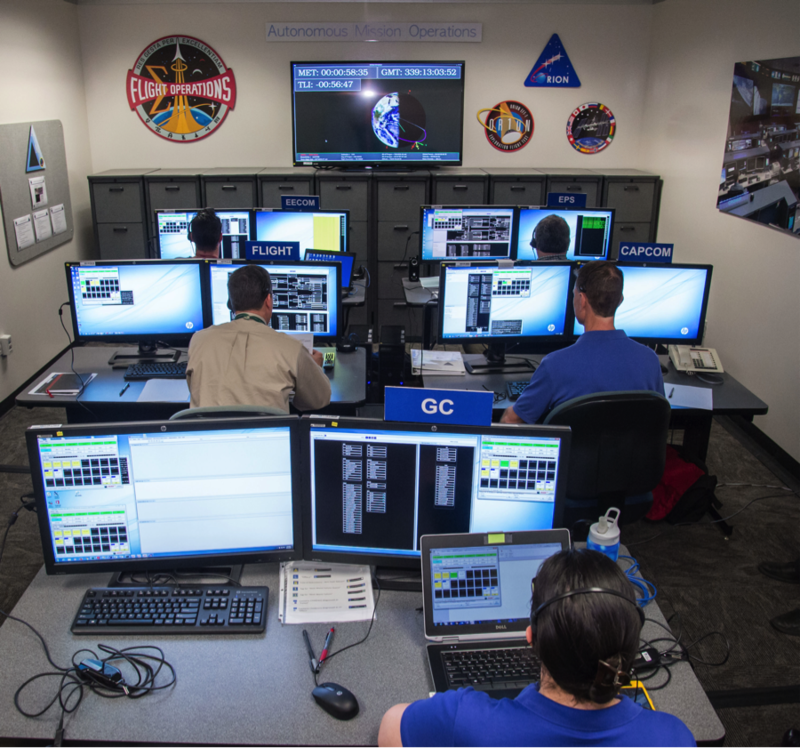 In early February, flight controllers and astronauts took part in a joint simulation to evaluate the prototype Orion crew display and control system, advanced caution and warning system for flight controllers and communication protocols. 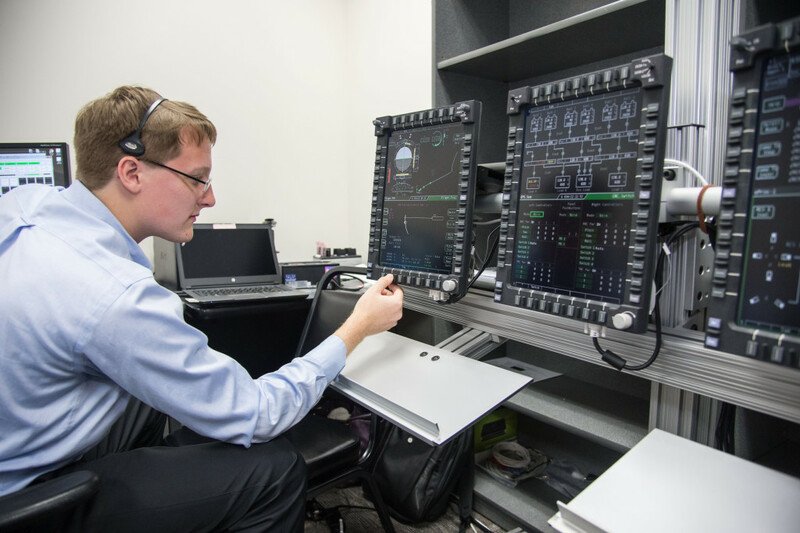 The test was conducted in the Rapid Prototyping Lab (RPL) at NASA’s Johnson Space Center in Houston, where engineers are creating and evaluating the display and control systems that Orion’s crew will use to navigate and operate the spacecraft. Orion will have a sophisticated display and control system as well as advanced software and operational concepts to aid the crew on long missions far from Earth, where astronauts will be required to work more independently than on missions in low-Earth orbit. On the space shuttle, there were nearly 2,000 switches and controls used to operate the orbiter. NASA’s new spaceship will have software to allow the crew to command the vehicle in most scenarios using just three display screens, saving mass and volume. “We’re evaluating a totally new software model that allows us to automatically diagnose if a failure occurs during a mission and for messages to be displayed for flight controllers on the ground,” said Haifa Moses, a human factors engineer who is working on NASA’s autonomous systems and operations project. The February simulation involved two astronauts and several flight controllers, including a flight director, capsule communicator or CAPCOM to communicate with the crew, and controllers who manage electrical power subsystems and environmental control and life support elements. Together they worked through a failure scenario in which part of Orion’s power system failed. This scenario required troubleshooting to get pumps and other systems back up and running to support the systems the crew needs to survive. Evaluating extreme failure scenarios is a routine part of training for mission in space. “This is one of the first times we’ve integrated these two teams and had communications across headsets and have been able to practice making calls,” said Moses. As the RPL continues to build and evaluate the displays for crew, it also is providing hand-on engineering experience for students in Texas. Mechanical engineering students at the University of Texas at Tyler have designed and built a mount to attach the cursor control device that serves as one way to operate Orion’s displays, also delivering their hardware to NASA in February. “The students worked through the product development process, conducted several different analyses and design reviews, along with building prototypes the same way that we do at NASA, which gives the students real world experience in the engineering field,” said Fox. Students from the university previously designed and built seatbacks and headrests for an Orion mockup housed at Johnson, which is used to train crew and evaluate hardware, along with additional support hardware. As engineers continue to develop Orion’s display, controls and software for crewed flights, teams will conduct additional simulations. The RPL will also continue to look for potential ways to include student ingenuity in the lab.